Betting on these three stalwarts in their industry today could fetch you incredible returns in your golden years. Who doesn't want to retire a millionaire? Unfortunately, studies show that the average retirement savings in America falls significantly short of the amount of money needed for a comfortable retirement. Fret not: One way to boost your retirement fund is to cherry-pick fundamentally strong stocks with encouraging growth prospects and hold them for the long term. Three such stocks, if invested in today, that could help you retire a millionaire are Welltower Inc (NYSE:WELL), Mastercard Inc (NYSE:MA), and Visa Inc (NYSE:V). Read along to know why. The U.S. Census Bureau estimates the 85-plus age group population to double in 20 years. One sector that's going to see frenzied demand from the aging population is healthcare, which is why I believe a healthcare real estate investment trust (REIT) has the potential to be a millionaire stock and add punch to your retirement income. Investing in rock-solid stocks is one path to retiring rich. Image source: Getty Images. Consider Welltower. It's not only the largest publicly listed healthcare REIT in the U.S., but also has one of the most well-balanced portfolios, in the sense that it covers nearly every aspect of healthcare, from senior housing to hospitals to post-acute care and outpatient medical solutions. As a REIT, Welltower acquires interest in healthcare properties and jointly operates and develops them with leading healthcare providers. That's a fairly low-risk business model, which is why Welltower's funds from operations (FFO) have grown at a staggering pace, growing nearly sixfold, to $1.4 billion since 2011. I see strong growth potential in Welltower's FFO for two reasons: the solid catalysts for the healthcare markets overall and the company's recent rejig of operations to focus more on the higher-margin private-pay healthcare properties. In short, Welltower operates in a high-potential sector and pays out fantastic dividends, thanks to its corporate structure, making it a great stock to own to boost your retirement income. My next two picks, Mastercard and Visa, offer a story that's entirely different from Welltower's, but equally intriguing. You've probably seen one of these two names etched on your credit and debit cards: Mastercard and Visa. The two companies operate in a duopoly, and mainly facilitate transactions made via credit, debit, or prepaid cards through their expansive payments-processing network across the globe. Every time someone transacts using a Mastercard or a Visa co-branded card, the companies earn a small fee. They also earn fees based on transaction volumes. 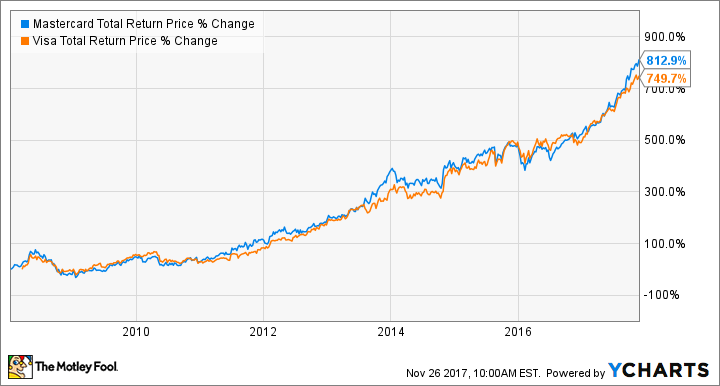 It's a highly profitable business that can generate solid cash flows, which is why the two stocks have delivered jaw-dropping returns in the past decade. MA Total Return Price data by YCharts. Both Visa and Mastercard are earning operating margins north of 50% and free-cash-flow margins of 40% or more. In short, Mastercard and Visa are cash-minting machines, and shareholders have been reaping rich returns from these machines over the years. Going forward, both companies are poised to grow leaps and bounds as digital payments increasingly replace cash. You'd be astounded to know that some of the fastest-growing and most populous economies in the world, like India, still function almost entirely in cash! That's where the opportunity lies. As more people go digital, banks and financial institutions will issue cards to allow customers to make cashless purchases from merchants, and process the payments with Mastercard and Visa's help. This "network effect," whereby every card issued and used adds value to Mastercard and Visa, is what makes their business models so enduring. 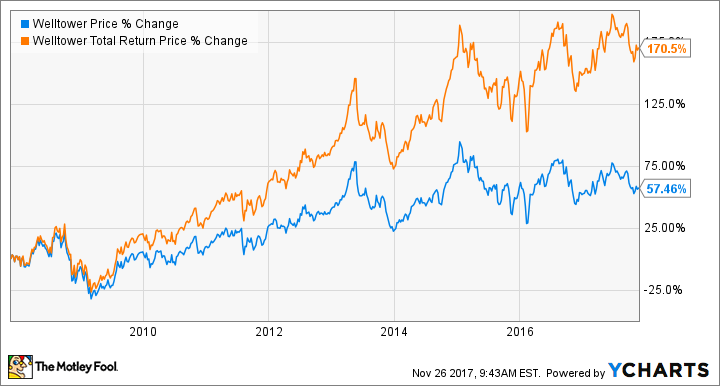 Both Mastercard and Visa are growing revenues and earnings at a rapid pace and have started paying out better dividends in recent years. They are aggressively investing in digital innovations and evolving into full-service payments networks as they get ready to ride the next wave of digitization. That's everything you need in a stock to help you retire rich.